Published: May 4, 2013 at 05:54 p.m. Updated: May 6, 2013 at 04:45 a.m. He's rehabbing a serious knee injury, but Robert Griffin III's life still seems pretty good. The Washington Redskins quarterback was in attendance at the Kentucky Derby on Saturday, taking in one of horse racing's great institutions for the first time. As is standard protocol in all RG3 interviews, NBC's Michelle Beadle asked him how the surgically repaired right knee is progressing. "Knee's feeling great," Griffin said. "Everyone saw those jumping jacks at the draft party, so I'm feeling good." Griffin put air quotes around "jumping jacks." As we noted last week, RG3 really did more of a hopping motion with some arm waving. It was a jumping-jack hybrid at best. Griffin wasn't the only NFL luminary at the event. Houston Texans quarterback Matt Schaub, Carolina Panthers coach Ron Rivera and Hall of Famer Warren Moon all were snapped by Associated Press photographers. 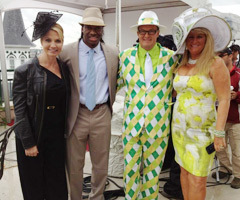 And who does RG3 have in the Derby? "I put a little money -- and when I say a little, I mean a little money -- on Palace Malice," he said. For the record, Palace Malice (a 22-1 long shot) is at post position No. 10. This also is Griffin's number. It's probably not a coincidence. UPDATE: Palace Malice led early but faded late to finish back in the pack, as Orb was the eventual winner of the 139th Kentucky Derby.